Click on the photos or text for enlarged view, narrative, and complete information of each pieces. "Tom Horn - Against the Wind"
BRONZE SCULPTURE became a new creative discipline for Larry in 1988. 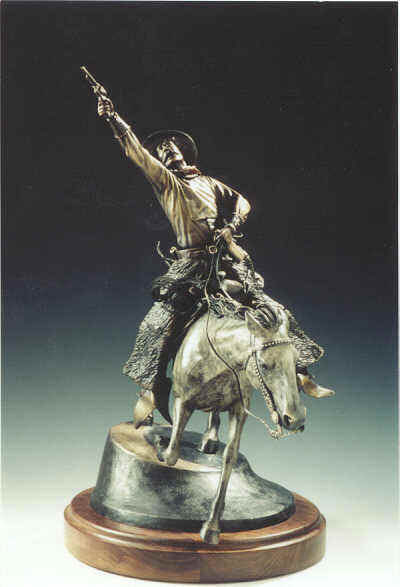 In 1996 he won the Sponsor's Choice Award for his bronze "Brothers of the Gun" at the Douglas Invitational Art Show and is now on permanent display at the State Pioneer Memorial Museum in Douglas, Wyoming. In 1999 he received The People's Choice Award for his bronze "Stolen Horses - Borrowed Time" at this show. VIEW EACH BRONZE by "clicking" on the text or photos at the left. Note Larry's attention to minute detail, and accuracy in clothing, tack and firearms in each piece.